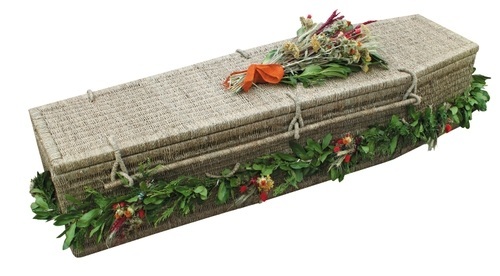 There are many possibilities when it comes to preparing a burial. The body can be buried as they are or use a favored blanket as a shroud. You can be creative by using objects that were most valued by the departed, such as a canoe they loved fishing in, or woven branches from a favorite tree interwoven with grasses from a beloved field. 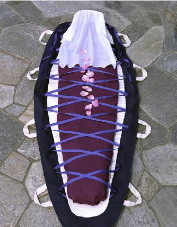 You can also request a local artisan to create a custom shroud or coffin. Below are a few options if purchasing a covering is desired, and a potential source of inspiration. Based out of the United Kingdom, Bellacouche Leafcocoons are made of locally sourced wool and wood. A padded wooden base is sewn in to two layers of thick felt. A soft felt shroud is secured to this and two further layers of felt give added strength and a smooth outline. Six strong handles take all the weight. Designs for the top cover are optional and are based on native trees. These shrouds are made from linen, canvas, cotton and other natural fibers, and they have paint (milk-based paint colored with pure pigments) or quilted accents and embellishments. 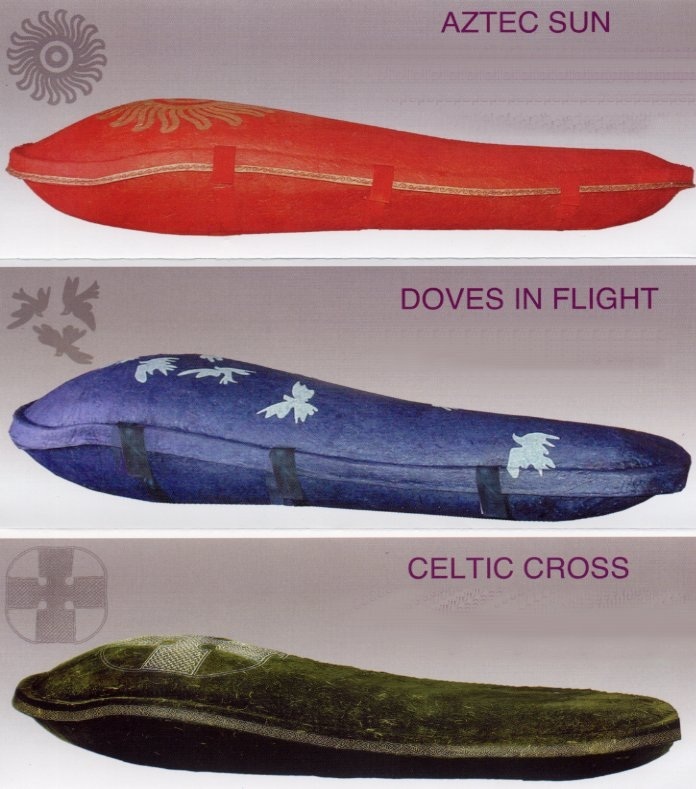 These shrouds incorporate a unique system in which the fabric is laced up securely around the body. This can easily be done by family members, and offers a simple, symbolic activity to share. When a group of family and friends does this together, there is a non-verbal "knowing" that happens. It's an elegant and tangible way to say goodbye. The Capsula Mundi is an egg shaped container made with starch plastic where the body is placed inside in the fetal position. 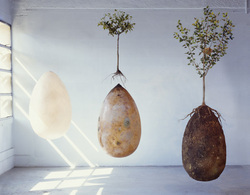 The Capsula Mundi is then planted like a seed in the soil with a tree planted on top of it. The tree is chosen when the person is alive, with relatives and friends caring for the tree after the burial. Creating a cemetery no longer filled with tombstones, becoming a sacred forest. The Capsula Mundi is particularly favorable for when a smaller burial space is needed. Made by hand from recycled newspapers and finished with paper made from 100% mulberry pulp, the Ecopod is available in a range of colours with and without screen printed motifs, plain white, or gold. These pinewood coffins are crafted from solid pine wood sourced from forests sustainably managed with Forest Stewardship Council guidelines. No plastic or metal whatsoever is used in the manufacturing process or left in the assembled product; uses biodegradable, non-toxic glue with no stains, varnishes, oils, or animal products of any kind. Functional rope handles are supplied. 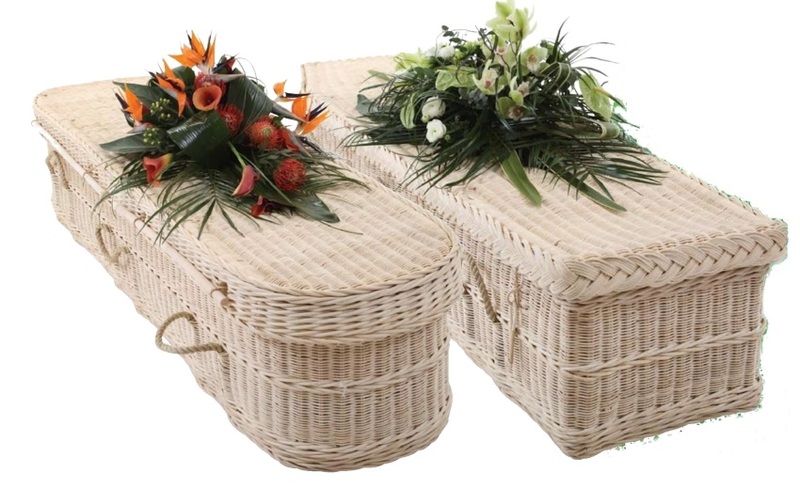 Coffins are supplied in easy-to-assemble flat-pack form. Assembly and can be done in a matter of minutes.